Art doesn’t have to stay in the gallery, it can come home with you as well. 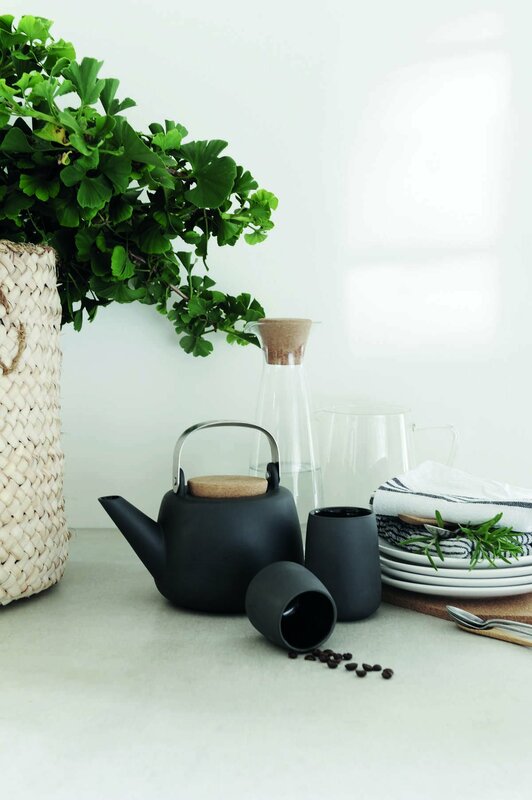 When you can’t be outside, indulge in the wonderfully textured finish of the Nicola Teapot. The generous size will give you perfectly brewed tea to be shared with your family. Size: L: 19.5 cm - W: 14.5 cm - H: 14.0 cm - Vol: 1.30 L / 44.00 fl. oz. Art doesn’t have to stay in the gallery, it can come home with you as well. Let the Nicola Teapot be the modern way that you brew tea for yourself and for friends. You’ll find the textural matte porcelain finish of this striking charcoal grey design sublime. 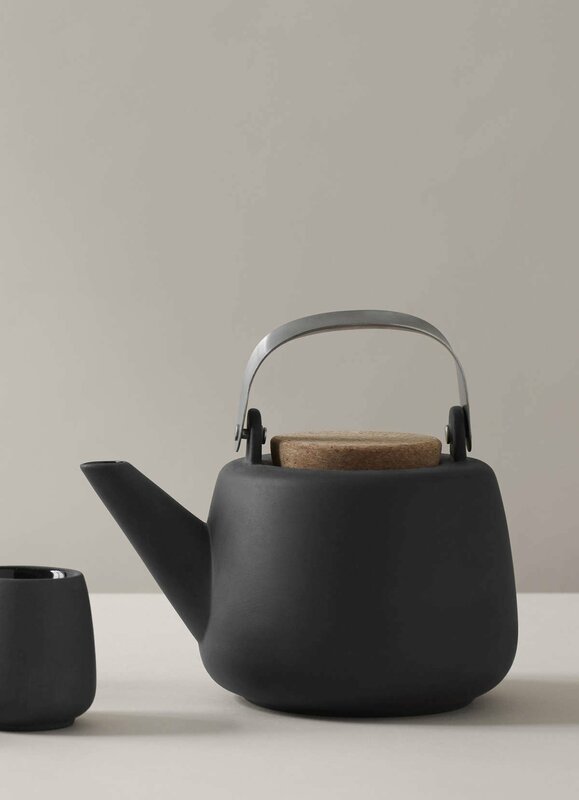 When you can’t be outside, indulge in the wonderfully textured finish of the Nicola Teapot. 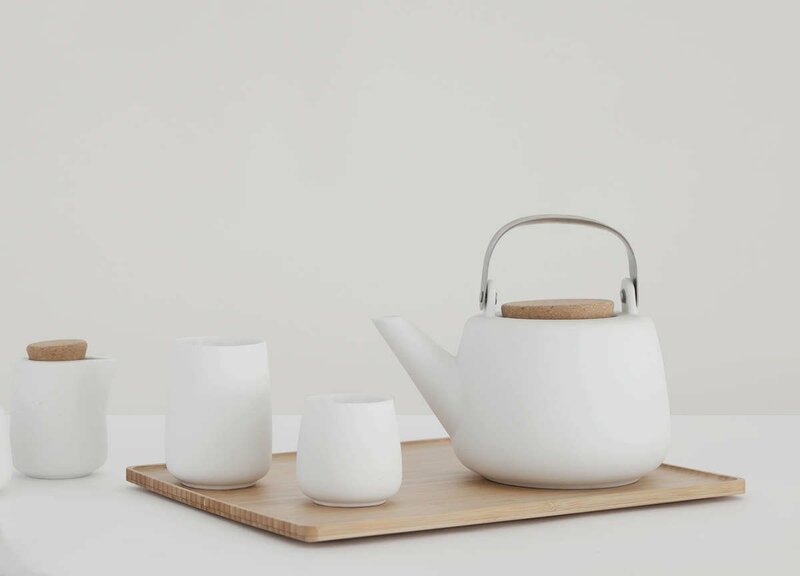 The beautiful crisp white porcelain of this teapot will connect you to nature. The generous size will give you perfectly brewed tea to be shared with your family. Art is the result of beautiful expression and emotion. It is something to admire and cherish. It’s something to brighten our lives. Anyone who agrees will know that spending a Saturday gallery-hopping is almost the perfect day. The paintings, sculptures, installations and screen prints are hugely inspiring and intriguing. Nothing seems like it could compare to this day. The only thing that could make it better would be to have some close pals alongside and something equally as delightful waiting for you when you get home. 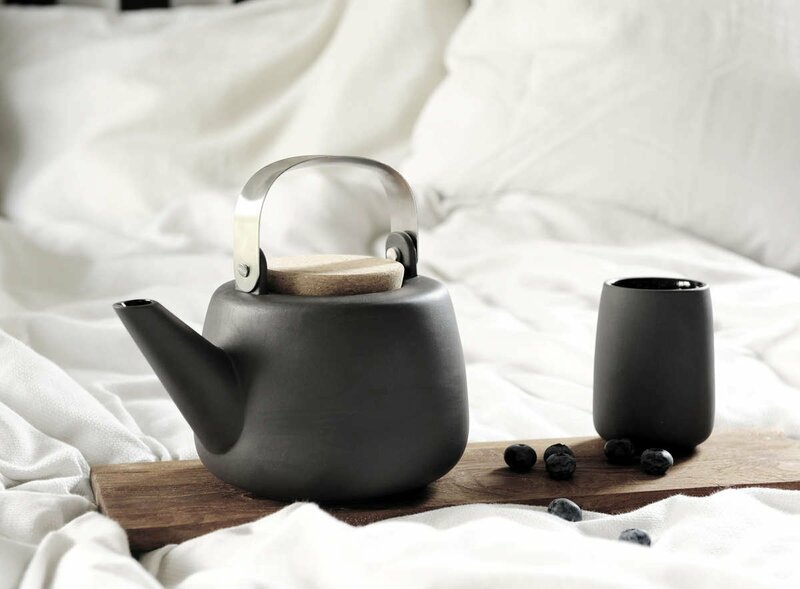 What’s better to come home to after a culturally enriching day, than a striking charcoal grey teapot? The answer is nothing. Have your friends relax as you prepare perfectly brewed tea in the Nicola Teapot for you all to enjoy. The textured matte porcelain of this bold-coloured teapot is an irresistible finish that your sensory-loving self will find hard to resist. You’ll love brewing and serving tea in Nicola so much that you’ll keep coming back time after time. The art lover in you will be drawn to Nicola’s clean modern shape, the mixed media of materials with the porcelain and cork, and her artistic style that she pulls off effortlessly. Bring a piece of art home with you when you acquire the Nicola Teapot. Every day of the week you dedicate time to being outdoors. Nature calls to you when you’re cooped up inside and so whenever you get the chance, you escape. Parks, beaches, forests, rivers and mountains are all of your happy places. Any moment to have fresh air in your lungs and sun on your face is one that needs to be seized. Even though being in touch with the outside world is what you love to do most, there are times when being at home is special too. When your family come to visit, staying home for a deep and lingering conversation over a pot of beautiful tea is complete bliss. This is why you need the Nicola Teapot in your life. The textural matte finish on this porcelain design feels organic and natural. It will connect you to the outdoors even when you’re happy to stay in. 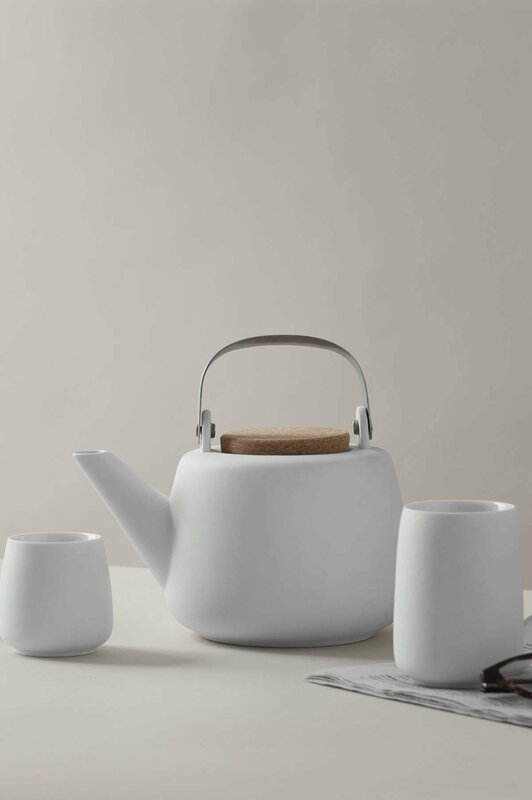 The crisp white colour of this part curvaceous, part linear teapot will bring the outdoors in. The lightness of the porcelain will make you think of the scent of jasmine, cherry blossom trees and fluffy clouds on a perfect warm day. Welcome your love of nature inside. Share it with your family. The Nicola is a 1.3 litre capacity teapot. This will make five large cups so it’s ideal for sharing with friends. Can I use this teapot directly on a stove-top? No, this teapot is not for stove top use or for use in the microwave. For best results, boil your water in a kettle, and pour boiling water into your teapot, where your tea can be conveniently steeped and served. Due to the Nicola’s clever design, the handle will remain cool to the touch so you can pour your tea with ease. Both tea bags and loose leaf teas can be used and brewed to perfection in the Nicola. Hand-wash this teapot in warm, soapy water. This porcelain teapot is not dishwasher safe, but it’s just as easy to hand wash as any other dish.